Levers for rear suspension unit to shift to the hardness (height). 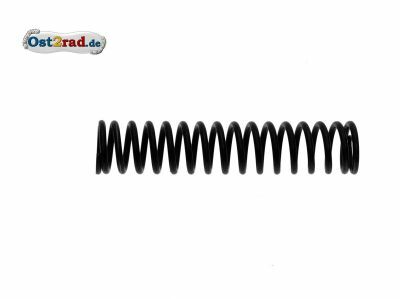 For original suspension struts with TS 250, TS250 / 1 and all ETZ with being outside spring, left page. 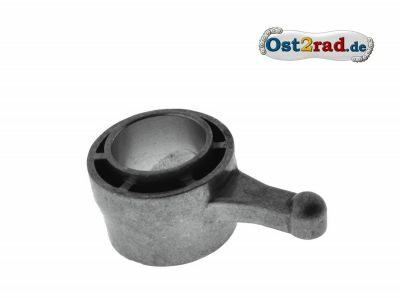 Material aluminium casting, original, solid implementation. 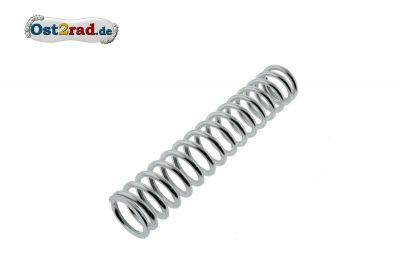 Other parts and springs for these shock absorbers are also in the shop. Levers for rear suspension unit to shift to the hardness (height). 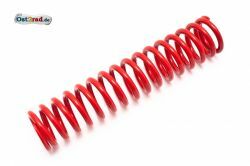 For original suspension struts with TS 250, TS250 / 1 and all ETZ with being outside spring, right page. 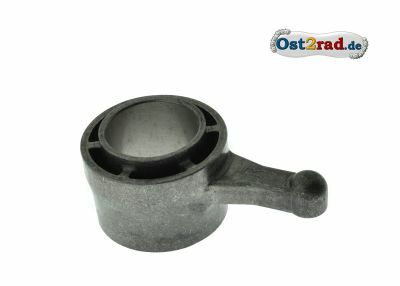 Material aluminium casting, original, solid implementation. 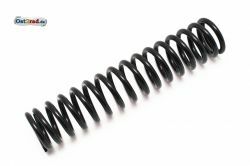 Other parts and springs for these shock absorbers are also in the shop. 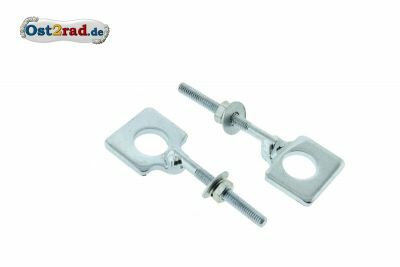 2 pieces chain adjuster, galvanised suitable for MZ, all ES, TS and ETS models and for ETZ125 und ETZ150. New parts, absolutely rustproof. 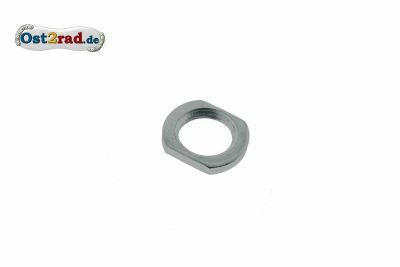 New adjusting nut for bearing pin, suitable for all MZ ETZ 125, 150, 250, 251. Neue Druckfeder für hinteres Federbein passend für ES125, ES150, ETS125, ETS150, TS125, TS150, ETZ125 und ETZ150. 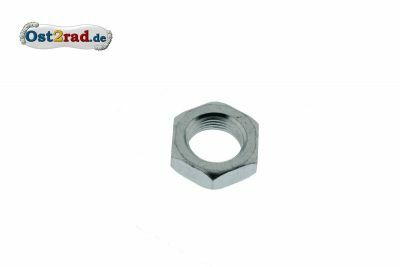 Passend für Stoßdämpfer hinten mit Chromhülsen. Die Feder ist blank, hat 17 Windungen und eine Gesamtlänge von ca. 26,5cm. Verchromte Feder für hinteres Federbein für alle standartmäßigen Stoßdämpfer mit außenliegender Feder bei Simson und ETZ 125/150. 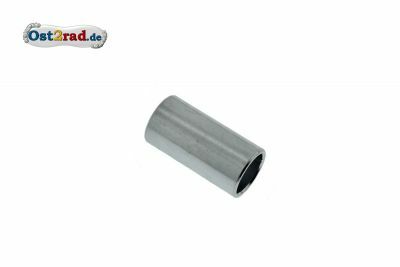 Innendurchmesser 41 mm, Drahtstärke 6,3 mm, Länge uneingebaut 275 mm, ca. 13 Windungen. 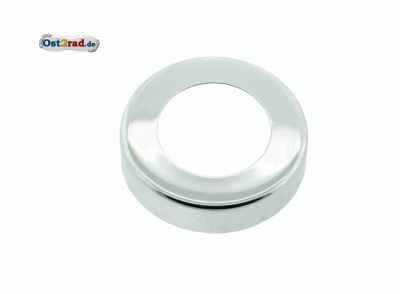 Neue Hülse für Gummibuchse Stoßdämpfer unten passend für MZ ES 175/2, ES 250/2, ETS 250, TS 250/0, TS 250/1, ETZ 125, ETZ 150, ETZ 250 und ETZ 251. Durchmesser 10mm. 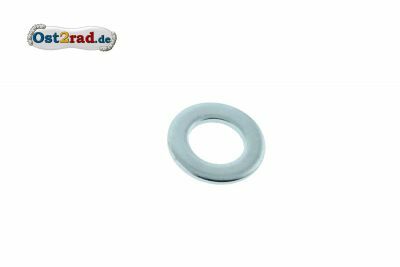 Neuer Gummi für Stoßdämpfer unten passend für MZ ES 175/2, ES 250/2, ETS 250, TS 250/0, TS 250/1, ETZ 125, ETZ 150, ETZ 250 und ETZ 251. 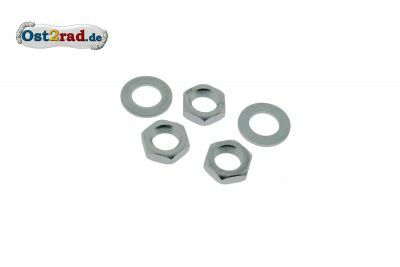 New set for the wrestling attachment suitably with MZ ETZ125, ETZ150, ETZ250, ETZ251, TS125, TS150, TS250 / 0, TS250 / 1 and ES250 / 2 consisting of 3x nut hexagonal M18x1,5 and 2x washer M18. The nuts and disks are galvanised. 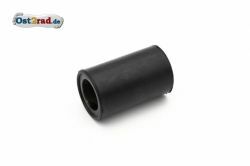 New black plastic sleeve for rear shock absorber suitably with all MZ ETZ125, ETZ150, ETZ250, ETZ251 and TS125, TS150, TS250. The sleeve sits under the chrome spring. Elastic buffer for the upper ring holder with MZ suspension struts. Fits to almost all models, inside diameters 16 mm. 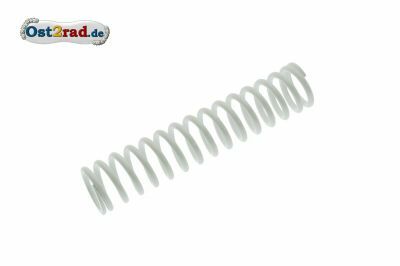 New rubber for the upper eye of the shock absorber incl. 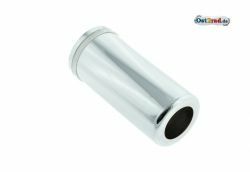 metal pipe with diameter 10 mm. Suitably to all MZ suspension struts offered by us. 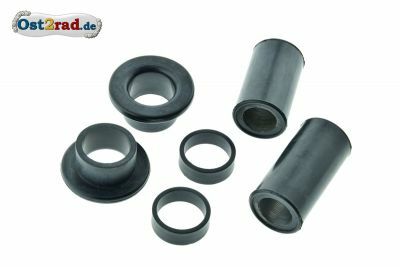 Outside dimension: For drillings in the suspension strut of 25 - 28 mm.